We compared sleep duration to the National Sleep Foundation Recommendations for 6 to 13 year olds and 14 to 17 year olds. 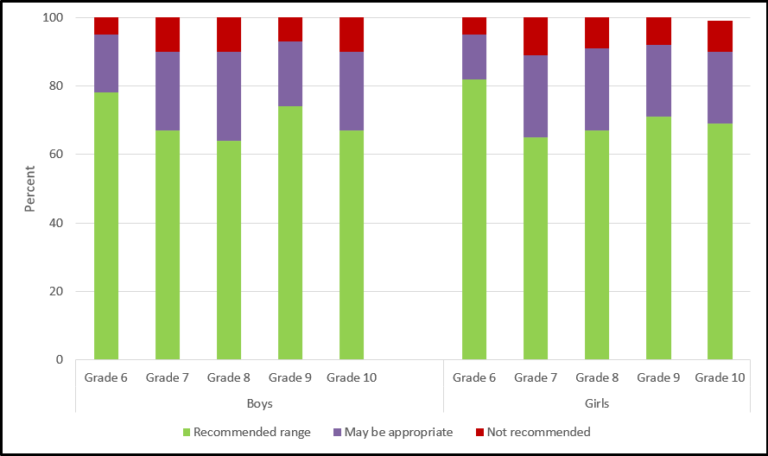 When compared to the National Sleep Foundation Recommendations1 for children and youth among Canadian students in Grades 6 through 10, the average reported nightly sleep duration fell within the recommended range for 64%-78% of boys and 65%-82% of girls. A further 17%-26% of boys and 13%-24% of girls had sleep durations that might be appropriate. 1Kidshealth. https://kidshealth.org/en/parents/sleep.html – accessed July 9, 2018.